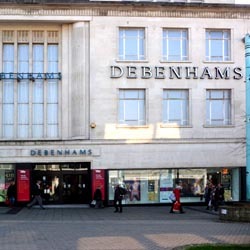 Debenhams is a large, long established store in the Plymouth city centre offering many of the major clothing brands, accessories, health and beauty products, childrensware and home furnishings. The Debenhams shop covers four floors and is accessible from both Royal Parade and from New George Street. The Ground floor has a large Health and Beauty Department with 12 major brands from Aramis to YSL. This is accompanied by an accessories department and the start of the women’s clothing departments. Men’s clothing is also located here together with a small café. On the Lower Ground floor there are further women’s clothing areas and the shoes. Most of the First floor is dedicated to women’s fashion and there are specialist areas for Lingerie and Shoes. The Second floor has some of the children’s clothes and has a large household goods area including goods for the bathroom, kitchen, china, bed linen and a wedding gift service. On the Third floor are found the furniture, travel accessories, some childrensware and the media and entertainment department. This floor also houses a large restaurant. Services include two restaurants/coffee shops, a personal shopper service, a bra fitting service and a wedding gift service. If necessary any purchases can be delivered to your car or goods can be delivered to your home or work address. There is also a hairdresser in-store as well as a Clarins Skin Spa. Naturally the store has excellent disabled access in all areas and assistance can be provided on request. For many things you do not have to go to the store, you can simply order on line and have the goods delivered directly to your door. Check out the availablility of any item on the Debenhams website.